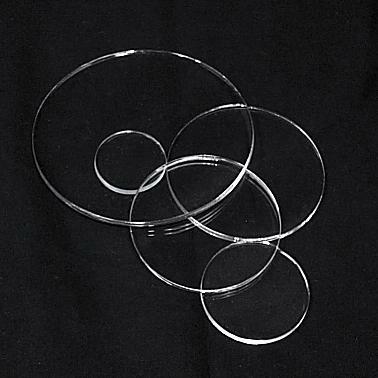 Clear Acrylic Disc 5/8" diam.x 1/8" thick. Flat, laser cut acrylic discs made from 1/8" material and shipped with masking still attached to prevent scratching. 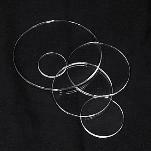 Clear Acrylic Disc 3/4" diam.x 1/8" thick. Flat, laser cut acrylic discs made from 1/8" material and shipped with masking still attached to prevent scratching. Clear Acrylic Disc 1" diam.x 1/8" thick. Flat, laser cut acrylic discs made from 1/8" material and shipped with masking still attached to prevent scratching. Clear Acrylic Disc 1-1/2" diam.x 1/8" thick. Flat, laser cut acrylic discs made from 1/8" material and shipped with masking still attached to prevent scratching. Clear Acrylic Disc 1-1/4" diam.x 1/8" thick. Flat, laser cut acrylic discs made from 1/8" material and shipped with masking still attached to prevent scratching. Clear Acrylic Disc 2" diam.x 1/8" thick. Flat, laser cut acrylic discs made from 1/8" material and shipped with masking still attached to prevent scratching.